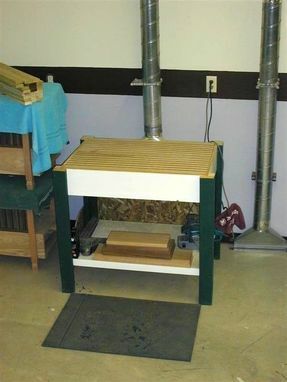 This Downdraft Table was designed and built to connect to the customer's central dust collection system. However, it could also be adapted to be used with any portable sho vac. It has heavy-duty casters so it can be pulled out away from the wall if large pieces need to be sanded. Built from construction-grade lumber like 2x4's and pine, it was painted to match the decor of the rest of the woodworking shop.